Authored by epriestley on May 1 2014, 2:30 AM. Ref T4398. 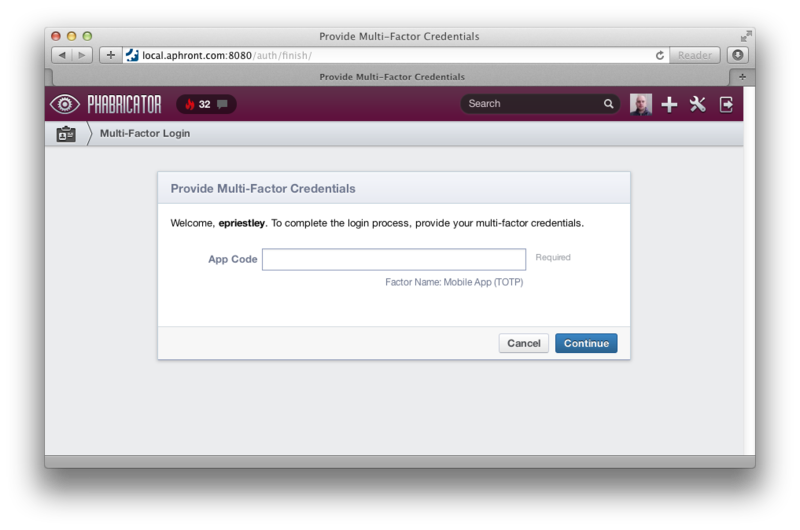 This prompts users for multi-factor auth on login. Roughly, this introduces the idea of "partial" sessions, which we haven't finished constructing yet. In practice, this means the session has made it through primary auth but not through multi-factor auth. Add a workflow for bringing a partial session up to a full one. Logged in as multi-factor user. Logged in as no-factor user. Tried to do non-login-things with a partial session. epriestley retitled this revision from to Require multiple auth factors to establish web sessions. epriestley updated this revision to Diff 21189. Closed by commit rP50376aad04d2 (authored by @epriestley).